I had seen the 1976 Academy Award Winner before, and still find it perfectly agreeable. Nothing about its technique or plotting is unique or even remotely interesting – instead, it’s all about the visceral emotions the actors evoke that draws you in. Sylvester Stallone comes across as an oaf attempting to give his best Marlon Brando impression, with a supporting cast that manages to make the fantasy seem more compelling. Talia Shire in particular, manages to make the film really work. 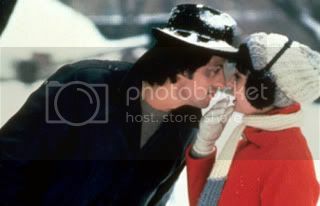 The film subscribes to a lot of romantic comedy tropes that makes the whole Adrian-Rocky relationship so memorable and sweet. What surprised me most about the film is how little boxing there happened to be – the film opens and closes with a fight, but the in-between is all Adrian and Rocky, with the budding relationship offering something of greater human value than training montages and the like. Rocky II is begins unlike any sequel I can remembers. 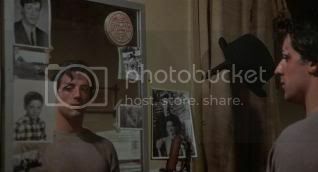 It takes place directly after the events of the first film, and to remind viewers, Stallone begins with the fight that ends the original. It’s a bizarre tactic, one that rung false given I had just watched the fight earlier. As the narrative picks up, the sense of exploration that Rocky and Adrian had for each other was gone, and instead the two faced forms of conformity upon their initial fame. I liked a lot of the ideas Stallone had for this sequel, particularly the notion of how heroes can be so quickly forgotten. Rocky attempting to assimilate within a new culture for the benefit of his family is admirable, but the whole execution feels off. If anything, it’s the narrative timeframe that Stallone decides to begin his story that I have a problem with. We’re positioned immediately after the events of the first film, which intrinsically causes problems because certain roles (particularly Adrian) display radical character overhauls that it’s difficult to accept such changes. The ideas are there, but a few more rewrites could have made this so much more interesting.